FastPass+ is Walt Disney World's ride and show reservation system. On this page you will find FastPass+ tips and strategies, how and where to make FastPass+ reservations in Animal Kingdom, and FastPass+ rules and restrictions. Animal Kingdom has a tiered FastPass+ system, meaning that the park restricts the number of FastPass+ reservations guests can make for its headliner attractions. Of the three FastPass+ selections that can be made in advance for each day, a maximum of ONE can be for an attraction in Group A below. There are 13 attractions at Animal Kingdom currently offering FastPass+. Avatar - Flight of Passage = 9 a.m.
Expedition Everest = 10 a.m.
Kilimanjaro Safaris = 12:30 p.m. The updated plans are very efficient - the average wait in line should be under 11 minutes per step during summer for our standard 1-day Unofficial Guide Touring Plan - with more than an hour of free time available in the afternoon. Which FastPasses Should I Get for the Animal Kingdom? Kilimanjaro Safaris is the attraction that most frequently uses FP+ in our Animal Kingdom touring plans. Why? It's not a thrill ride, so it appeals to everyone in the park, from small children, to adults, to seniors. It's also very popular, so it appears in all of our touring plans. Another advantage of using FastPass+ for Kilimanjaro Sarafis is that you can choose whether to experience the standard daytime safari, or try the nighttime version. 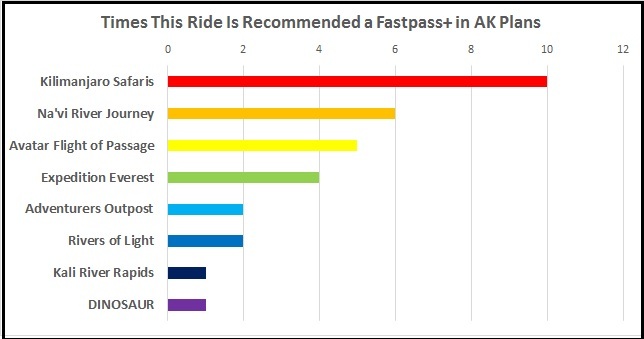 We recommend FastPass+ for the new Pandora attractions -Avatar Flight of Passage and Na'Vi River Journey - more than any Animal Kingdom attractions except Kilimanjaro Safaris. Both rides are in the same FastPass+ tier, so you have to choose which one you'll use your advance FastPass+ for. If you plan to ride Flight of Passage, we think that choice will save you the most time in line. If you're not riding Flight of Passage, get a FastPass+ for the Na'vi River Journey. Expedition Everest is the attraction that appears next in our list of best FastPass+ attractions at the Animal Kingdom. Because it's a popular thrill ride, it appears in all of our 'tween, adult, and "whole family" touring plans. 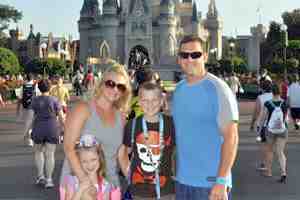 Beyond those attractions, your choices for a best FastPass+ attraction depends on the ages of your family. Meet Disney Pals at the Adventurer's Outpost character meet and greet shows up on our Animal Kingdom touring plans for parents with small children. It’s probably not going to be the first stop of your day, and using FastPass+ at the Outpost will generally save more time in line than using FastPass+ at any other child-friendly attraction in our plans. Similarly, Rivers of Light, Kali River Rapids, and Dinosaur are reasonable FastPass+ recommendations in some scenarios, such as days with late arrivals. If you can get a FP+ reservation for the attractions shown, anywhere near the times listed in the plans, the touring plans will work exactly as shown, and your waits in line will be minimized. If you need to choose other FastPass+ attractions or times, our free computer-optimized touring plan software will incorporated those. I repeat Step 3 for the two FP+ eligible attractions with the highest wait times throughout the day. I re-optimize the plan after each attraction, because saving a bunch of time on one attraction may allow the Optimizer to uncover other ways to save you time throughout the day.